OXFORD, Miss. 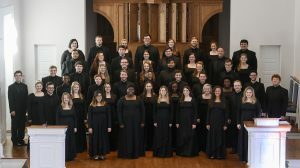 – The University of Mississippi Concert Singers will travel to New York City to perform in the world-famous Carnegie Hall this weekend. The Concert Singers were invited to perform at 8 p.m. Sunday (April 8) by Distinguished Concerts International. The group will be singing a wide range of pieces, including classics, contemporary pieces and Mississippi originals. Previous travel experiences for the Concert Singers have included tours to Europe, with performances in Austria, Czech Republic, France, Germany and Hungary. While in New York, the Concert Singers also are to perform a program of sacred repertoire on the concert series at St. Patrick’s Cathedral, at 4 p.m. Friday (April 6). The choir also will attend two Broadway musicals and participate in sightseeing activities. “The singers have worked extremely hard in preparation for this unique opportunity,” Trott said. “The music department and the university will benefit from the exposure of having Ole Miss students performing on this world-renowned stage. The opportunity to perform at Carnegie Hall “will be an inspiring and thrilling experience for our students,” said Robert Riggs, UM chair of music.